This past spring I realized we really didn't have a great selection of books about gardening here at home. If I wanted to get serious about gardening with my kids, I knew that I needed to spark some joy and interest. Introducing some gardening books to our shelves seemed like a great addition to the concrete work that we have also been doing in the garden. So, I thought I would share some of the Montessori friendly gardening books that we have either checked out from the library or purchased for our own collection. If you have a child interested in gardening or want to spark some interest, these are all a wonderful place to start. Row 2: Lola Plants a Garden | Two Little Gardeners | In the Garden* | Plants Feed Me | How Does My Garden Grow? Books with ~ are those better suited for slightly older children. They are heavier in text. Books with * are great for even older babies and young toddlers. So many of these have become instant favorites here at our house! And, now that our garden is planted and the weather is warm, I can't wait to take them outside for reading each afternoon! Have you read any of these? 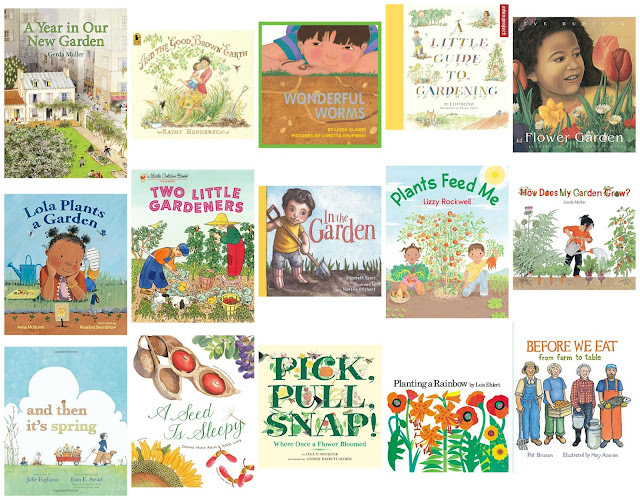 Do you have any other Montessori friendly gardening books you would add to this list?